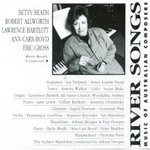 River songs / Betty Beath ... [et al.]. Points in a journey : a cycle for voice, flute and piano / by Betty Beath. Contents note: The salutation - Now I'm six - Meeting in the road - The she-wolf - Prayer. Commission note: Commissioned by North Adams State College, Massachusetts. 21 Jul 2011: at Syzygy Ensemble- Wandering Troubadors (Melbourne Recital Centre). Featuring Syzygy Ensemble.